Event Description: An appealing place for a corporate teambuilding scavenger hunt, scenic and fun-loving Lahaina –steeped in history — pretty much has it all: shops, theaters, restaurants, museums, galleries, ancient buildings, killer ocean views and easy access to the luxury resorts in Kaanapali. 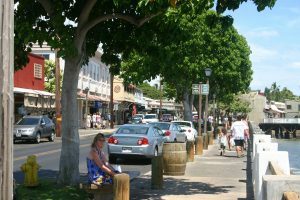 Location History: Once the capital of Kamehameha’s Hawaiian kingdom in the early nineteenth century, Lahaina had reinvented itself by the mid-1800’s to become a major port for the Yankee whaling fleet. Missionaries continually battled with sailors for the moral standards of the people of Lahaina; sailors battled with each as well. Today, Lahaina is like a tidy New England whaling town plunked it in the middle of the Pacific, with atmosphere and entertainment galore. During your corporate teambuilding treasure hunt…expect to explore fascinating buildings from the town’s missionary past; wander through Chinese and Buddhist temples; circle Hawaiian royal ruins; visit a shop where you can mail home a coconut. If it can be found on Maui, you’re bound to find it in lively Lahaina. See our other Maui corporate team building events.